Problab Technologies Pvt. 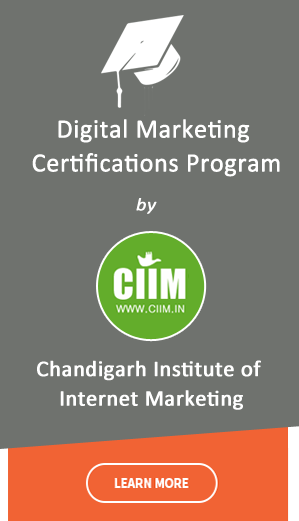 Ltd., being a well-established Digital Marketing Company located in Chandigarh, India, has come up with a drastic ploy to nab excellence like offering digital marketer as technical resource for a certain business or project purpose. There are plenty of digital marketing houses to propose their whole team for a specific business perspective. However, by having in-house online marketing team or to hire digital marketer, anything can essentially play fundamental role for prosper of business. Responsible for developing marketing strategies and techniques to promote company’s product in the field of social media. Indulged in web analytics, e-mail marketing (e-mail blasts) and search engine optimization (SEO). Construction of social-media (e-mail) campaigns and promotions to promote companies product and spread its message. Researching new consumers and innovative methods to reach potential consumers through various social media sites. Translation of business goals to effective Search Engine Optimization (SEO) campaigns, analysing the performance of the SEO campaign and make needed improvements. Increasing/ improving company’s websites ranking and overall presence on internet (Increasing daily time on site and daily page view per visitor and reducing bounce rate). Overseeing internet marketing campaigns from program management to execution and directing the other members of the company/ company such as sales executives, content managers and web designers. Other areas of work include: Pay per Click (PPC) campaigns which is sponsored online advertising paid for by the company; Mobile marketing which may include development of company’s mobile app, SMS marketing, etc. ; Affiliate marketing that is allowing other business to sell their product on their website. Researching new online media opportunities and platform that could benefit the company either through social-media, blogs, online conferences etc. Integrating and developing content marketing strategies. But before that, let’s take a look at our teams. We know that with right team, any goal is achievable. We have the best brains in the industry, who believe that the learning curve should never be stagnant. We divided our members into 7 WOW teams according to the right skill sets. Search engine optimization: This is to market your website on search engines like Google, Bing, Yahoo. We make sure whenever your audience searches with your keyword, he finds you right there on search results. Pay Per Click: Being among the top 3 Bing accredited companies in the world, No. 1 Bing accredited company in India and also a Google certified partner, we are an expert in PPC. Social media marketing: When it comes to social media marketing, you not only need to understand your social audience, but also be equally proficient in handing social ads. We know the drill. Take a look at our social media portfolio. App store optimization: No matter how cool or unique your app is, if it’s not optimized for app stores (Google Play, Apple Store etc.) no one will get to know about your app. We do it for you. Facebook app development: Facebook marketing is incomplete without Facebook apps. They are the unique way to make your user database stronger. We not only design, but also develop these apps to better market your services and products. Website Design and Development: Website design and development is the basic step for having a digital presence. Content marketing: Content marketing is an umbrella term for content creation and promotion. We have a skilled team for all types of content requirements, be it SEO content or webpage or blog. Affiliate Marketing: This is an old marketing model to connect with the right people for your business. It’s based on a simple business model. You pay people only when they generate business for you. We can help you manage your affiliate marketing well. Mobile Apps Development: More than 50% of your customers are online on their smartphones. In this scenario, going mobile is not an option, rather a must for all businesses. We develop and market mobile apps that will be best for your business. Online Reputation Management: Online world is a big bad world, where everything you do stays forever, sometime without your knowledge. So, keeping a close eye for 24*7 is a must for any business to track who is saying what about the brand. Let us do the hard work. Why should you hire digital marketer from us? Associate with finance division and prepare proper budget for certain project.